Place frozen shrimp in a bowl and cover with cool water. Add 1 tsp salt and allow the shrimp to soak until they defrost. Remove skin, then drain water. Season shrimp with salt, old bay, cajun seasoning, and pepper then massage seasonings in well. Add eggs and milk to a bowl, then whisk for 45 seconds. 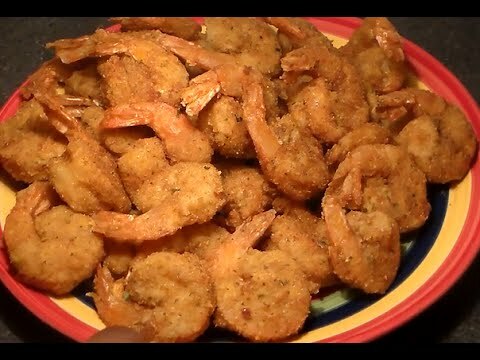 Coat shrimp with flour, then shake off excess flour. Dip shrimp into an egg wash, then drain excess egg. Coat shrimp well with Italian breadcrumbs then set aside for 15 to 20 minutes. Place a pot over high heat. Preheat oil for 7 to 9 minutes. Add shrimp and fry for 1-1/2 to 2 minutes. Once done, sit shrimp aside on a paper toweled plate to drain excess oil. For cocktail sauce, combine ketchup with sriracha and stir in well.